The holiday parties have begun and many of us need a little something to take to the hostess of the party. Or perhaps you want something cute to add to that gift you are giving! Check out these bottle toppers! They are very quick to knit and make that bottle of wine, Irish cream, etc look festive. You can knit plain hats and scarves from a few yards of worsted weight yarn...we used Twizzle and Monarch. Or you can use a textured yarn like Moguls. And of course adding a beard in Moguls to make a Santa topper is a fun touch too. 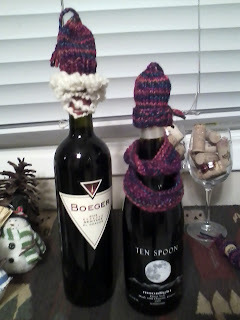 Here is the free pattern for these Wine Bottle Toppers and Santa Wine Bottle Toppers. I recently made several of these Korknisse for gifts too. The red one uses our Twizzle and the green one uses our 4/8's Wool. They take just a few minutes of time and are SO cute. Enjoy the holiday celebrations and share a touch of knitted fun with your friends!